We knew we couldn't count on bright and sunny days when going for a break to the beautiful Provence. I wanted to show you some of the wool I'm going to work with in the near future.... Earlier this week I met Cecilia from Ilóyarn again - she was happy about the Lacy, Lazy Boyfriend I had made for her, and I was so happy to receive some of her beautiful alpaca! 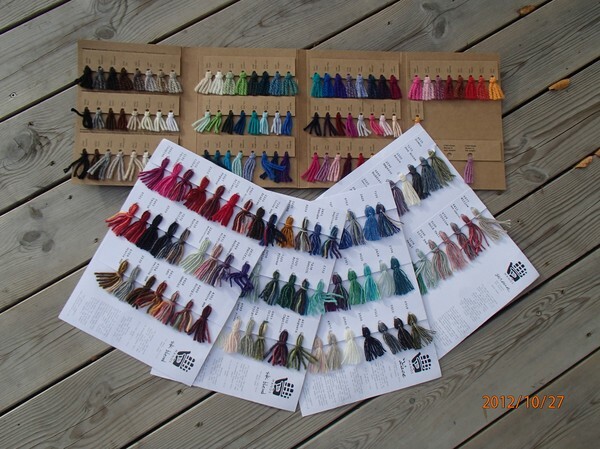 I had already fallen in love with the red one - I have a Christmas-dress swirling in my head destined for it. But first things first - the "Birch" shade of Artesanos Aran is going to be turned into a cozy, belted cardigan. I can't wait to get started! In the same delivery I also received the shade-cards (thank you, Jenny!) of all the Manos and Artesano-yarns. I can barely leave them out of my sight! Below the "Birch" shade in Aran from Artesano, in company with the red "Chile" in DK Artesano. I didn't mean this to happen! Ready to wear! Hopefully they will stay as a couple - we have an awful tendancy of losing one half of a pair. Maybe the cuffs will make them stay in place.! Wow! 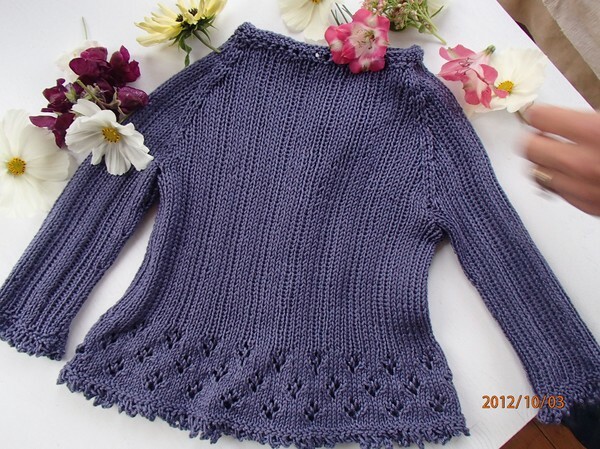 I didn't expect such interest for my most recent pattern; the "Lacy, Lazy Boyfriend". THANKS to all of you sending questions, comments, hearts... I appreciate it so much!!!! If we go back a long, long way we find some spanish blood in our veines! It was one of the reasons that I chose the name Tres Hermanas for my newly launched pullover, dedicated to my sisters. In some way I'm a bit obsessed by spanish language, culture, country. 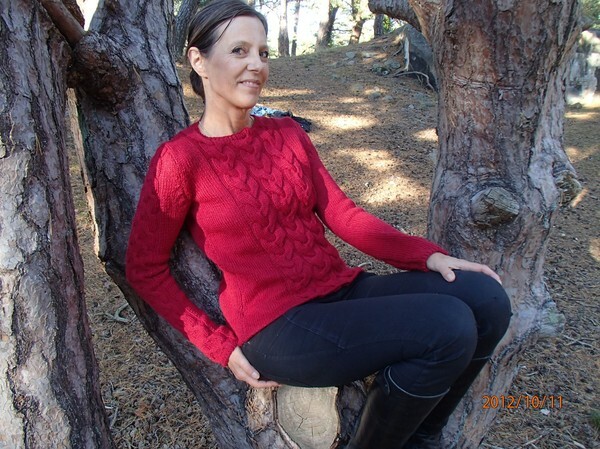 And I find the color I used for this pullover so SPANISH too - deep red, difficult to tell exactly which shade - somewhere between raspberries and granate apples. 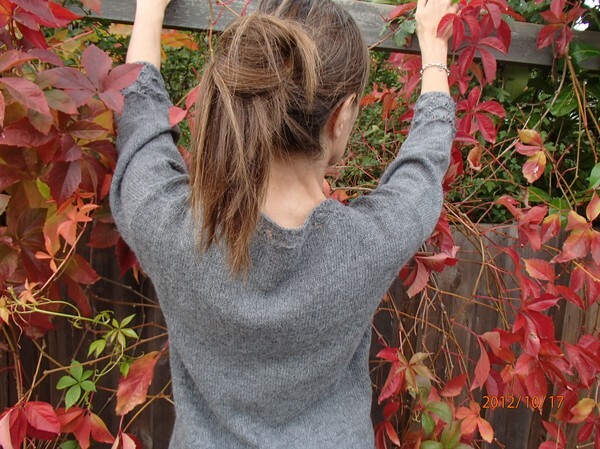 I really enjoyed working with this pullover. 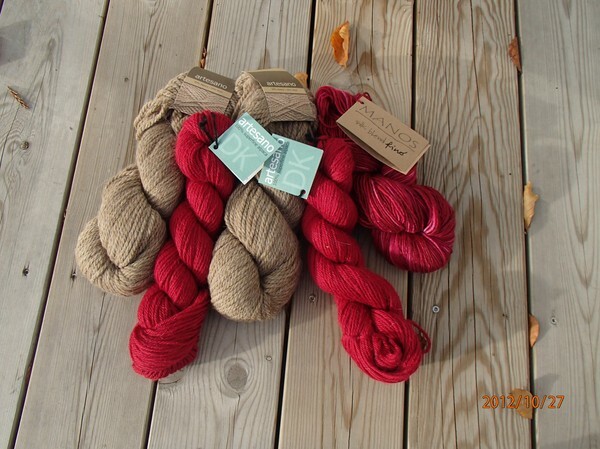 The alpaca DK from Artesano was incredible! The structure of the cables shows off beautifully, the texture is even, smooth, soft and firm in the same time. I love it! Today I had a great meeting with the importer and representative for the Bolivian, eco-friendly alpacawools called Ilóyarn. 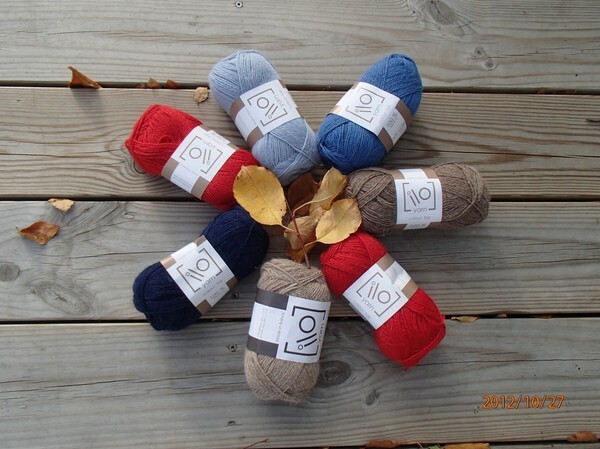 I have made up some designs in this wool already - as I came across of it some months ago in a yarnstore in southern Sweden. 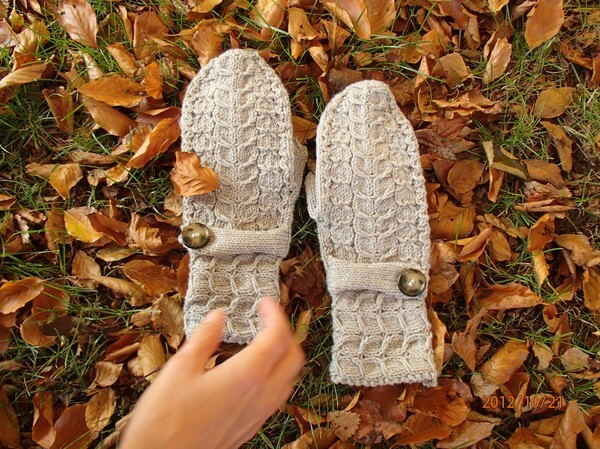 It was more or less love at first sight - and when I started working with the incredibly soft alpaca I became totally addicted! 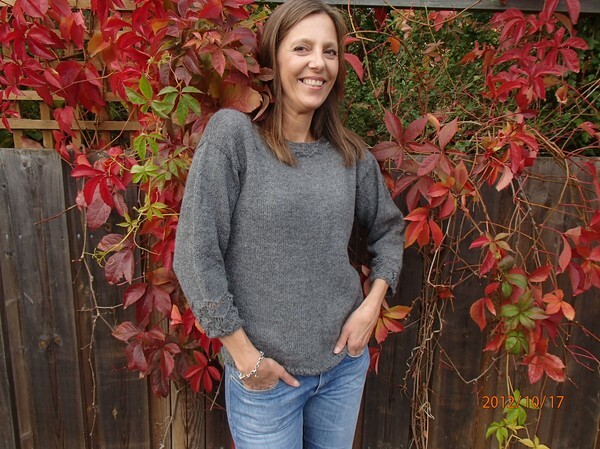 My Soft Diamonds are made in it, my most recent Buckwheat Blossom Cardigan set is made of it, and below is a photo of my first design in this alpaca; the Teatime Cardi. You can buy the alpaca from several yarnstores in Sweden, as well as from the internet-store "Garnasinne". A much younger (obviousely) cousin of mine, living in the north of Norway had her 3rd child earlier in the year. After 2 adorable boys she gave birth to a tiny baby-girl! We are living on such a distance to eachother - and this spring I had the opportunity to meet her and all her children. This is the one and only time I've seen her children at all - i hope they will not be too grown-up before I meet them again!!! 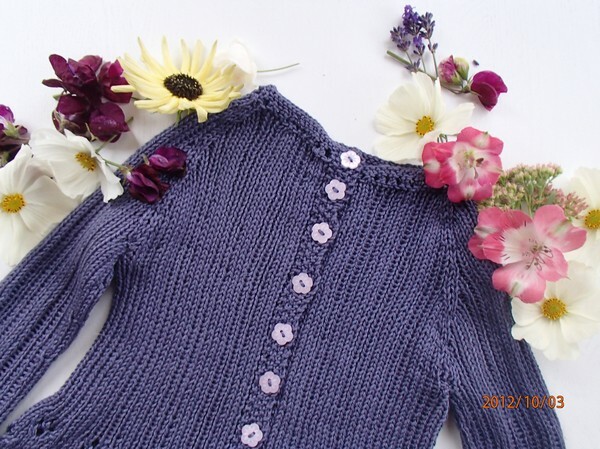 The Multiflora cardigan is for the small girl - the size I went for is the 12months - I hope she can wear it for some time! Flowers are late autumn blooms from my garden - we can enjoy them until the first frost comes - any time now.